Reader’s Theater Tips | it's yaytime! 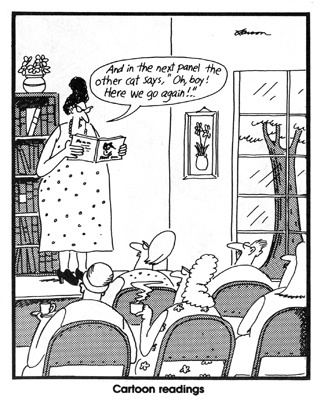 There’s a long tradition of reading books out loud to a captive audience. Reader’s Theater takes that idea to another level by letting multiple readers (or even the audience) get in on the fun, performing various roles. With graphic novels it’s a bit tricker to set up, but equally rewarding. Unlike picture books where you can read a passage and then turn the book for the audience to see the full page illustrations, graphic novels are made up of multiple images per page that are constantly intermingling with the text. Even if everyone in the audience had a copy of the book in front of them, you couldn’t guarantee everyone was following along at the same pace, which takes away from the group experience. 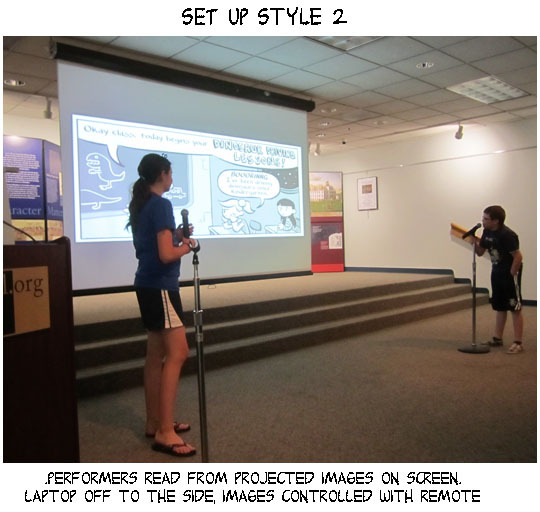 So graphic novel authors have opted to use the technology of Powerpoint (or Keynote) to create visual presentations of their comics, often editing the pages into single panels that can be projected one at a time. This may not be “pure comics,” but it controls the reading speed, allows for anticipation and creates a unique interactive experience, where each reading is completely original. 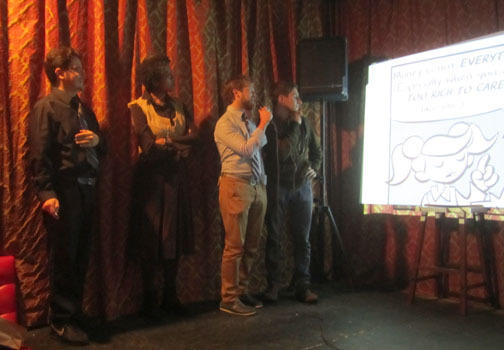 Cartoonist R. Sikoryak hosts a series of slideshow events called Carousel, which were my first introduction to how fun a comics-based reader’s theater could be. Over the years, I’ve gotten to collaborate and perform with Sikoryak and many other talented artists, creating different variations in reader’s theater, and I wanted to share some tips to encourage others to get into the act. 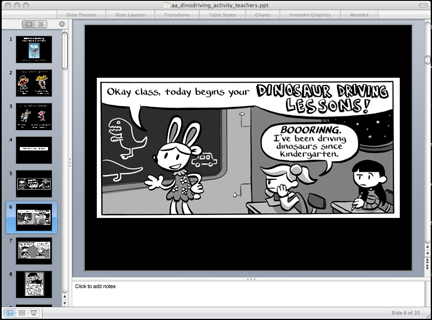 A sample of of my reader’s theater files is posted here: Astronaut Academy: “Dinosaur Driving” [PPT] for reference. Feel free to use it as well! The simplest option is to just run a series of sequential images out of a folder using a picture viewing program like Preview. Presentation software like Microsoft Powerpoint or Keynote will provide you with a lot more flexibility and control of your presentation. You can even add music and other effects if you wish. Images imported into Powerpoint or Keynote should be about 125 dpi. You’ll want them just a bit crisper and larger than what you would use for the web. 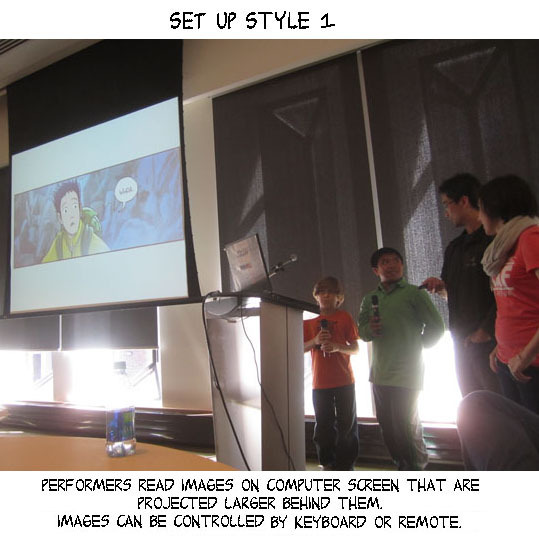 You can certainly import full comic pages into your slide show, but similar to passing around copies of the book, it doesn’t allow for maximum control over how the audience engages with the material. Chopping up a page into individual panels allows you to have full control over which panel is read and when. If you have more than one word balloon per panel you could even edit your art so that you have multiple files, each with a separate balloon. This is obviously a lot more work but gives you the ultimate level of reader control. -Digital projector with VGA computer cables OR ability to connect laptop to Smartboard and project a Powerpoint presentation. You can even use an HD TV set if you have the right DVI to HDMI Cable to mirror your computer screen to the monitor. *Bonus equipment: I’ve recently started using a USB Logitech Wireless Presenter remote. These are great because you can control the Powerpoint presentations from as far as 100 feet away from your computer (without having to point it directly at the screen like you do with an apple remote). Depending on the model, some remotes include a countdown timer and a laser pointer! -A microphone/amplification system will help for a crowd larger than 20 students…especially if you are working with kids who are not confident readers. The microphone also gets readers into the “performance” mindset, and brings creativity out of people! There’s no exact way to set up a performance space, but here are ways I’ve found them to work best! The benefit of this layout is the readers are more comfortable. They can focus on just what’s on the screen, and not so much about standing before the audience. Benefit of this layout is you don’t need the table and chairs! -Always make sure the audience has a clear line of vision to the screen and that the readers/performers are not blocking the images. -Test the microphones before you start the reading. -When selecting readers, always make sure they are confident at reading out loud. It’s very easy to get tripped up when reading under pressure! -Different readers will interpret a character differently, so try repeating the same slideshow with different people to see what they bring to the performance. *More video samples and additional powerpoint samples coming soon! 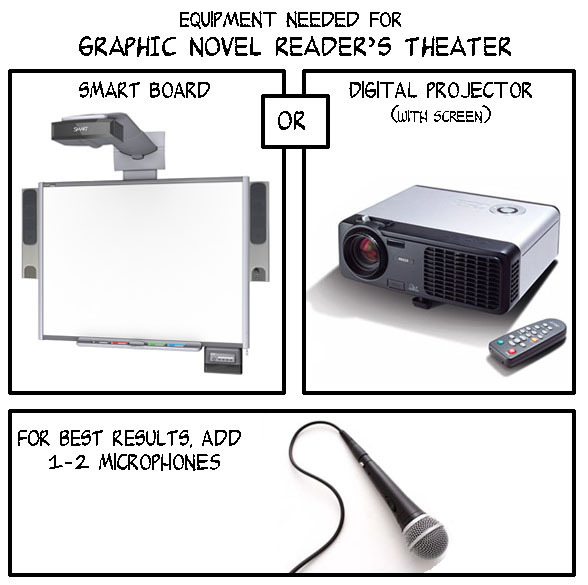 I had never thought of doing reader’s theater with graphic novels. This might be a great idea for my Graphic Novel Book Club at the library… thanks for breaking it down. Ooh, you’re giving me the confidence I need to get readings of Peanut (illustrated by Paul Hoppe) ready to rumble! Thanks!